Randy Adams of Arkville, NY. Deer was havested on a chilly Nov. 24 morning at 8 am. Buck scored 137 220 lbs. Randy saw deer on November 19, 2018 chasing a doe and did not want to risk a bad shot. He continued hunting each morning until he got second chance on Nov. 24, 2018 in which he made a good clean kill. 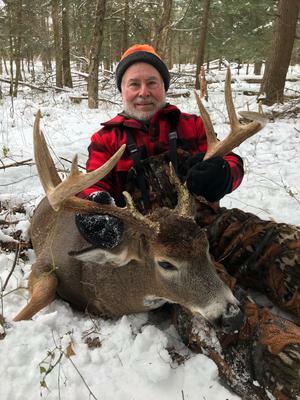 Outstanding NY buck and an outstanding dertemined hunting effort by Randy Adams of Arkville, NY!